Thirsty Pilgrim: Gratuitous Shot of a Dirty Bottle of Lambic from the Cellar. Gratuitous Shot of a Dirty Bottle of Lambic from the Cellar. I'm learning that getting a book out is a bit like making sausage. You don't want to know. Part of putting this thing to bed is plugging in a few art-holes. That's what I call them. In one art-hole we needed a photo of Cantillon Kriek. "Easy," I thought. "Got one in the cellar." Actually it's a 10-year-old bottle. And it's filthy. 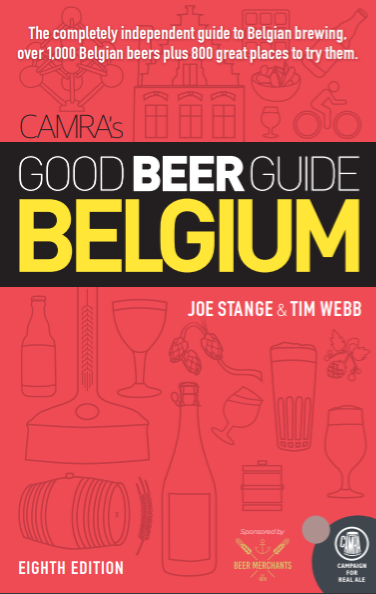 I bought a few of them at the SBS drinks market here in Brussels before some rich Danish person swooped in and bought its entire stock of vintage beers. Drank one, still have two. I'd consider opening another one, but I'm fascinated by the filth that's accumulated. Somehow they've gotten three times as dirty in the 18 months they've been in our cave. More than I want to taste them, I want to see how much nastier these bottles can get. Meanwhile: There's now a Facebook page for Around Brussels. It might even become useful once my friends and family pipe down. Ah, Facebook. If you're on that there Facebook thingy, please sign up and help spread the word to anyone who might make good use of a book like that. If you're not on Facebook yet, and you value your spare time, then run away while you still can. Now. GO! Don't leave us hangin'! 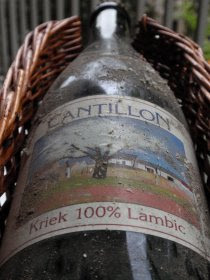 How was the 10-year-old kriek? Maybe you wrote all about it in that there facebook thingy.